Evzacoin is a company specializing in trading on stock markets. 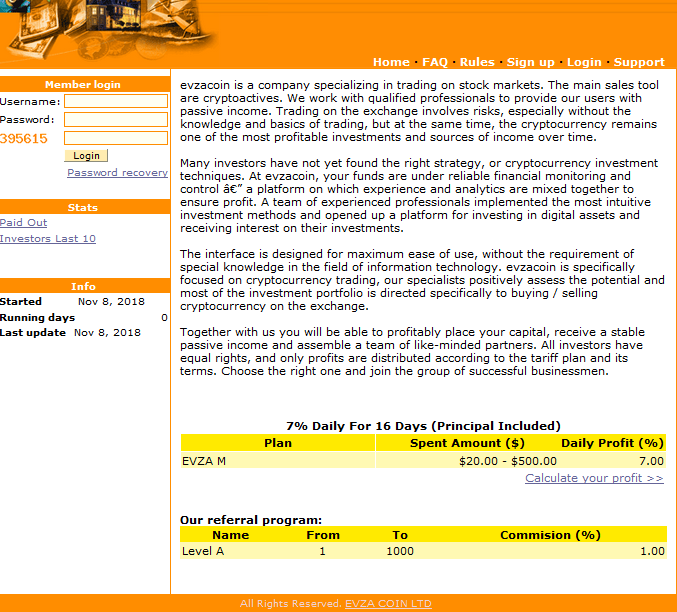 The main sales tool are cryptoactives. We work with qualified professionals to provide our users with passive income. Trading on the exchange involves risks, especially without the knowledge and basics of trading, but at the same time, the cryptocurrency remains one of the most profitable investments and sources of income over time. Many investors have not yet found the right strategy, or cryptocurrency investment techniques. At evzacoin, your funds are under reliable financial monitoring and control â€” a platform on which experience and analytics are mixed together to ensure profit. A team of experienced professionals implemented the most intuitive investment methods and opened up a platform for investing in digital assets and receiving interest on their investments. 11.22.18 16:49	Account	Receive	+7.00	Received Payment 7.00 USD from account U17188072 to account U1................ Batch: 236932444. Memo: API Payment. Withdraw to vertex from EVZA COIN LTD. The amount of 1.4 USD has been deposited to your account. Accounts: U17188072->U1*. Memo: API Payment. Withdraw to Ruslanis from EVZA COIN LTD.. Date: 14:25 22.11.18. Batch: 236916151. 11.23.18 17:29	Account	Receive	+7.00	Received Payment 7.00 USD from account U17188072 to account U1............... Batch: 237057492. Memo: API Payment. Withdraw to vertex from EVZA COIN LTD. The amount of 1.4 USD has been deposited to your account. Accounts: U17188072->U1*. Memo: API Payment. Withdraw to Ruslanis from EVZA COIN LTD.. Date: 10:40 23.11.18. Batch: 237011103. 11.24.18 18:09	Account	Receive	+7.00	Received Payment 7.00 USD from account U17188072 to account U1............... Batch: 237165615. Memo: API Payment. Withdraw to vertex from EVZA COIN LTD.
11.25.18 18:27	Account	Receive	+14.00	Received Payment 14.00 USD from account U17188072 to account U1............... Batch: 237256331. Memo: API Payment. Withdraw to vertex from EVZA COIN LTD.
11.26.18 18:31	Account	Receive	+7.00	Received Payment 7.00 USD from account U17188072 to account U1................ Batch: 237368144. Memo: API Payment. Withdraw to vertex from EVZA COIN LTD.
11.28.18 17:55	Account	Receive	+7.00	Received Payment 7.00 USD from account U17188072 to account U1................ Batch: 237592620. Memo: API Payment. Withdraw to vertex from EVZA COIN LTD.
11.29.18 17:36	Account	Receive	+7.00	Received Payment 7.00 USD from account U17188072 to account U1................. Batch: 237699808. Memo: API Payment. Withdraw to vertex from EVZA COIN LTD.